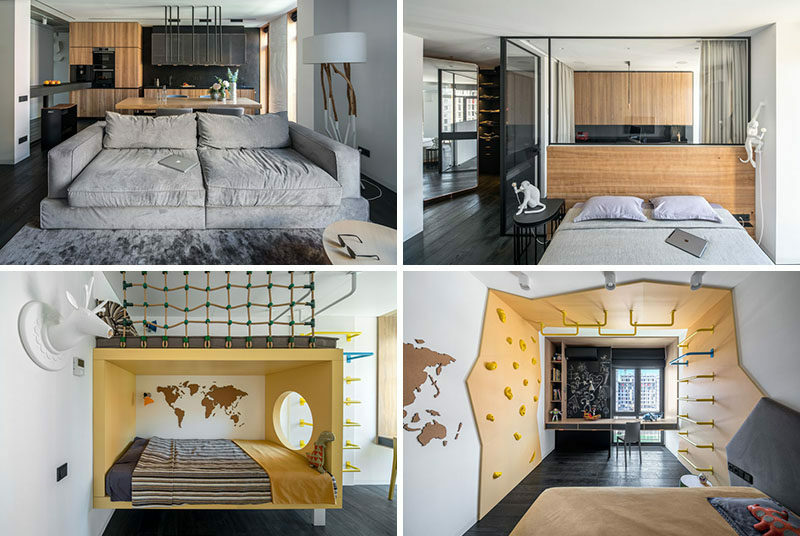 Ukrainian based Maxim Doschinsky and Pavel Voitov of design studio ZOOI, have combined two smaller apartments (a one bedroom and a three bedroom), and transformed them into a large family apartment. In the living room, decorative wall panels that imitate a massive rough stone have been added to create some natural texture in the space, while a bright blue chair named “Bird’s Cage” was created by the designers to add a pop of color to the interior. 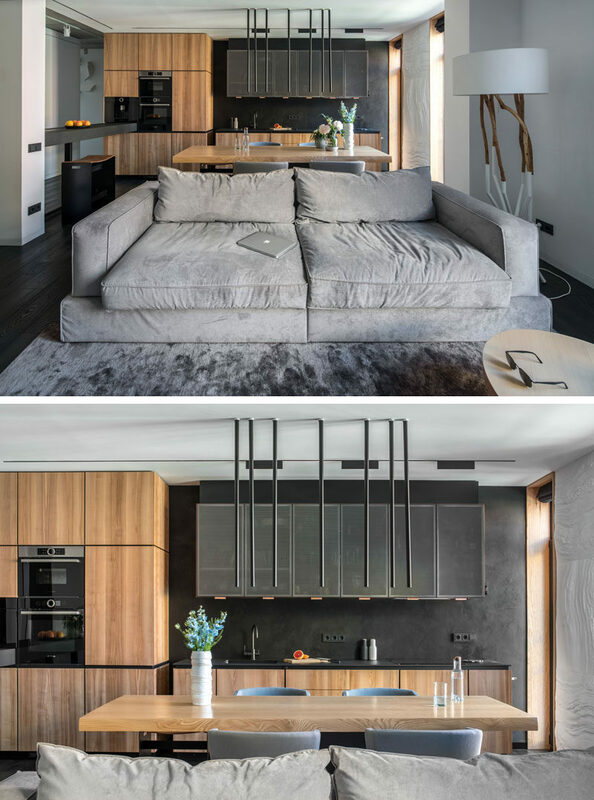 The kitchen and the living room were combined into an open space, which is separated by a light grey couch. 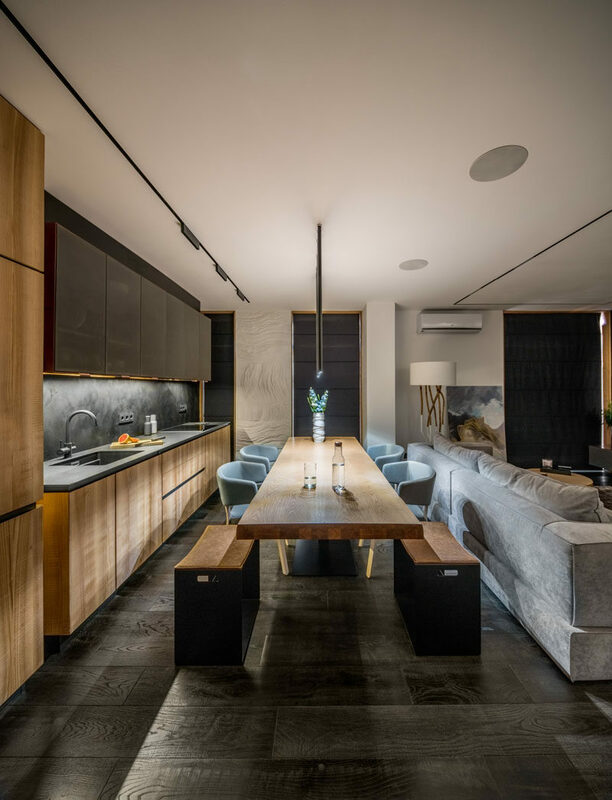 In the kitchen, a wood table surrounded by seating creates a place for food prep and family meals, while the kitchen cabinets run along the wall. The upper cabinets in the kitchen were custom designed by ZOOI, and made locally from perforated copper. At the end of the kitchen is a breakfast bar, which can be access from the hallway too. 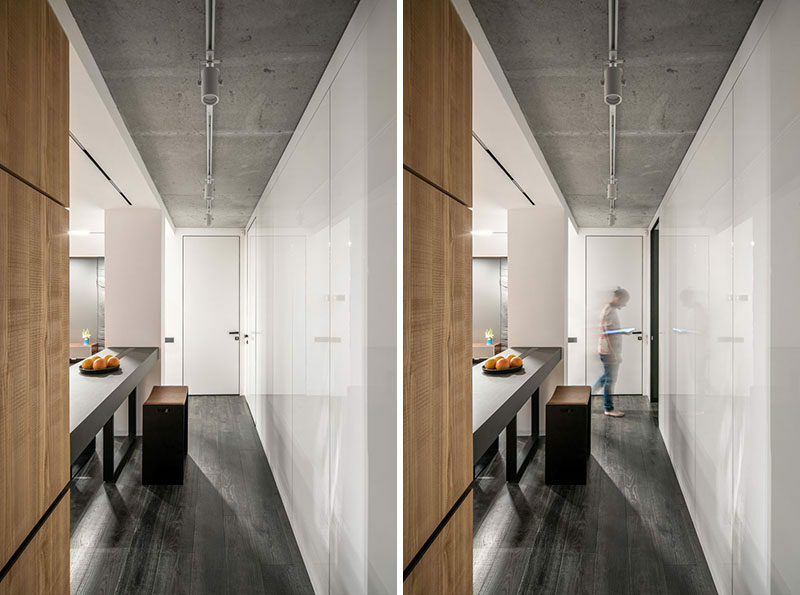 A hidden door within a wall of glossy white cabinets provides access to the other areas of the apartment. The master bedroom suite has four rooms in one. The bedroom, a home office, a walk-in closet, and an ensuite bathroom. The bed faces a wall with a wall mounted TV and a long floating cabinet. 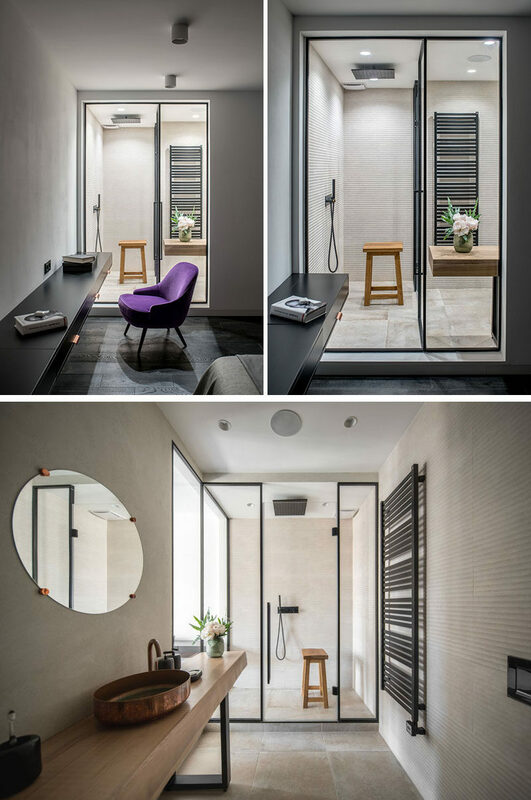 At the end of the cabinet is a large window that looks into the shower of the ensuite bathroom. Behind the bed, a glass partition has been used to separate the home office from the sleeping area. 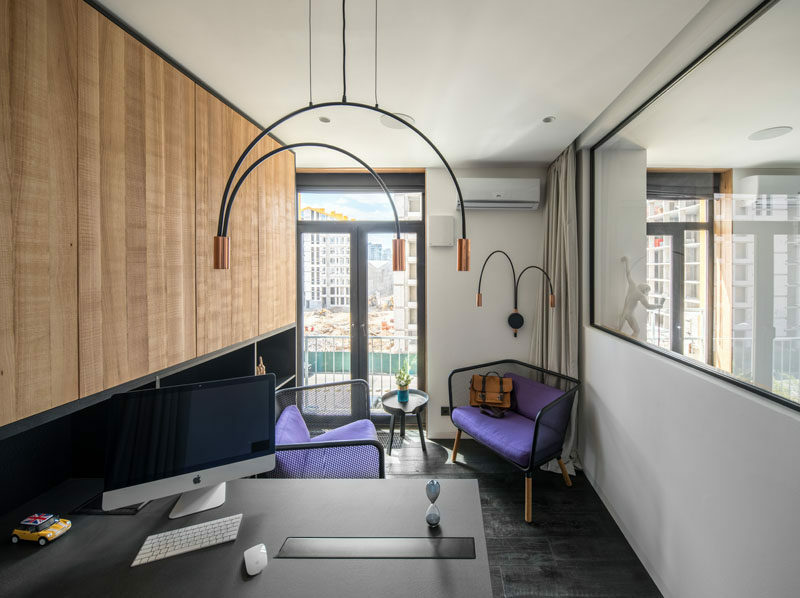 In the office, if someone is working late and the other person is sleeping, a curtain can be pulled across to cover the glass partition and block the light from the room. 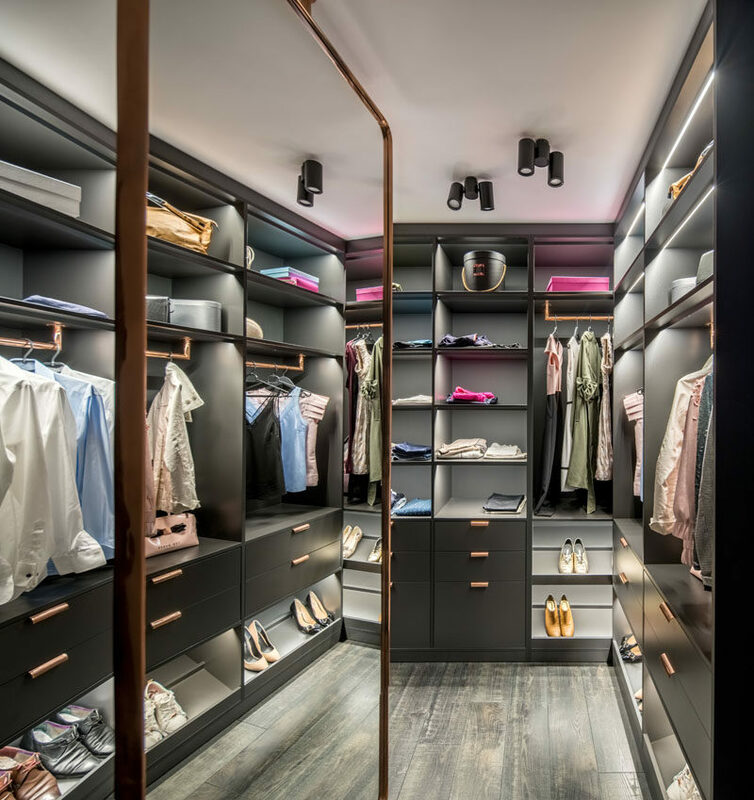 The walk-in closet has custom shelving with lighting that fills the walls, and a large mirror. The apartment also has two bedrooms for the children of the family. 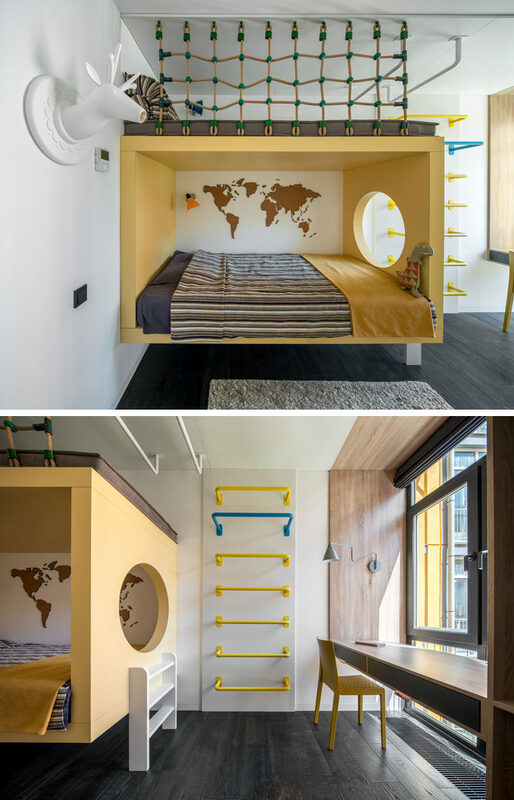 The first bedroom has a custom climbing feature that wraps from one side of the room to the other, and separates the sleeping area from a desk by the window. In the second children’s bedroom, the bed is surrounded by a yellow frame with a circular cutout that looks towards the window. A ladder on the wall leads up to a a reading nook above the bed, while against the window, a custom designed desk sits within a wood frame. 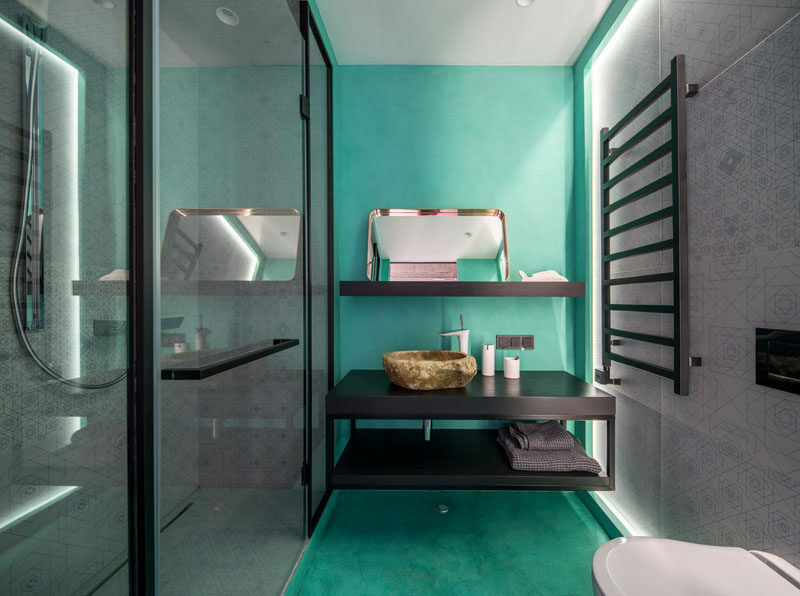 In the bathroom, bright turquoise on the floor and wall adds a pop of color, while the walk-in shower and opposite wall both have the same decorative tile.